I love going to cooking classes, especially when they are participation and the students do the cooking. So when my friend and fellow food blogger Patricia Rose, of the blog Fresh Food in a Flash, invited me to her cooking class, I was really happy to go along and photograph the whole thing. Her Weekday Dinners Cooking Class was St. Patrick’s Day themed and there was green everywhere. Balloons. Aprons. Plates and napkins. Maps of Ireland. 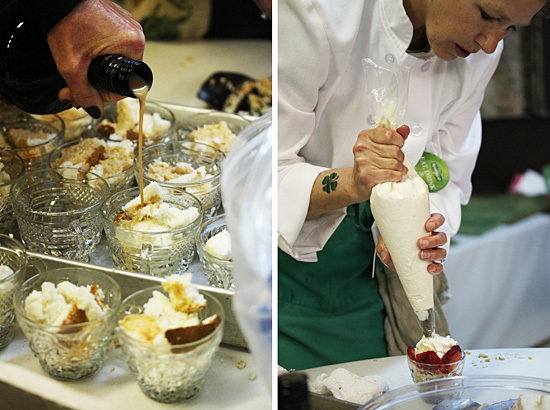 As you can see in the photo of the Bailey’s Irish Cream Trifle above, that included little green shamrock flags. The trifles were generously doused with Bailey’s and here you can see Patricia demonstrating how to pipe the whipped cream. 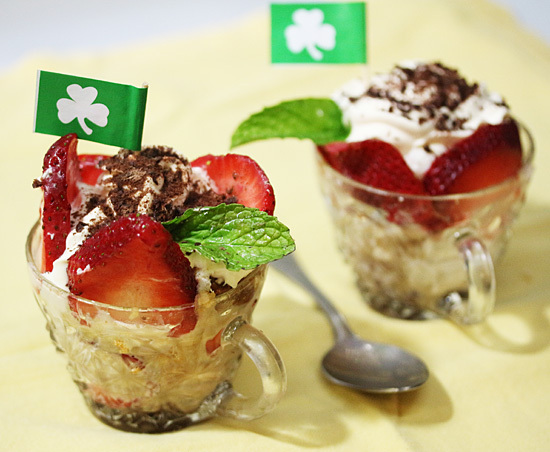 The recipe for the Bailey’s Irish Cream Trifle is included below. Here is Patricia at the beginning of the class going over each recipe so the students would know the ins and outs of each before getting industriously to work. 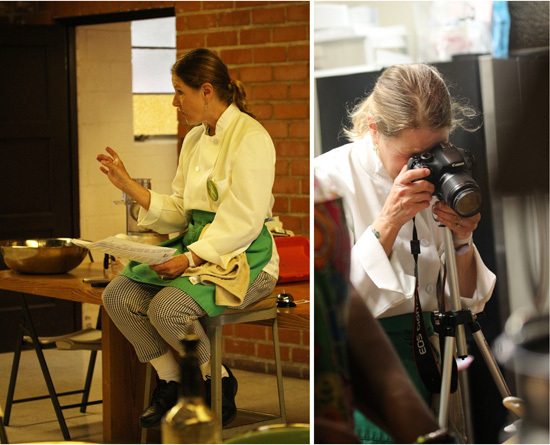 Patricia is not only the chef instructor, but also a food blogger with a camera, documenting the dishes as the class moved along. We started off with an hors d’oeuvre of a selection of wonderful Kerrygold Dubliner Cheddar cheeses and some Irish Soda Bread that Patricia had made. 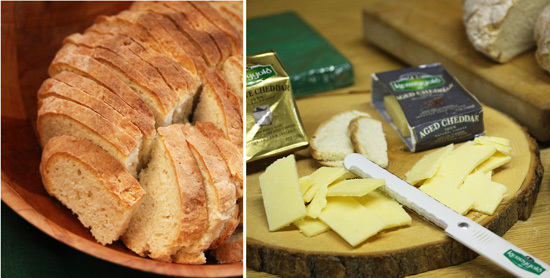 The bread was a perfect foil for the delicious cheese and had a really nice texture. By the time dinner was served, the cheese and bread were all gone. The four entrée dishes were set out buffet style so everyone could help themselves. 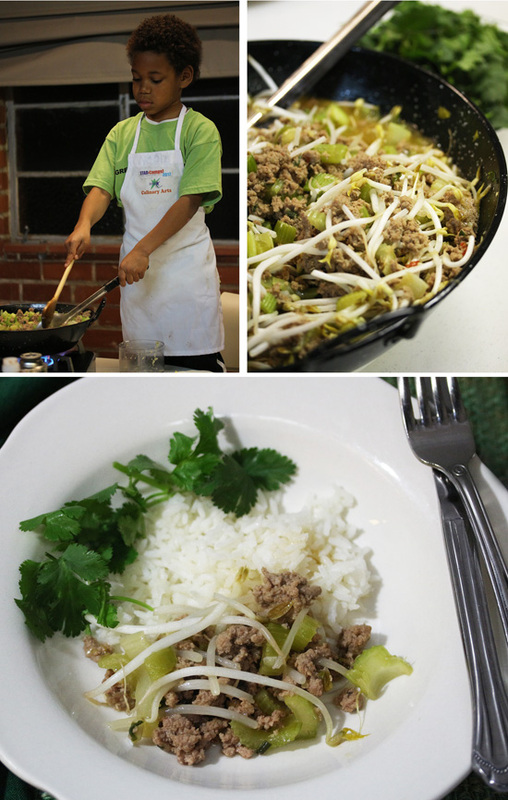 The Turkey and Rice Chow Mein was so flavorful with Sambal Olek, fresh ginger, garlic, and ground turkey and sliced celery. Here you can see the Junior Chef Trainee with his turn at the wok. 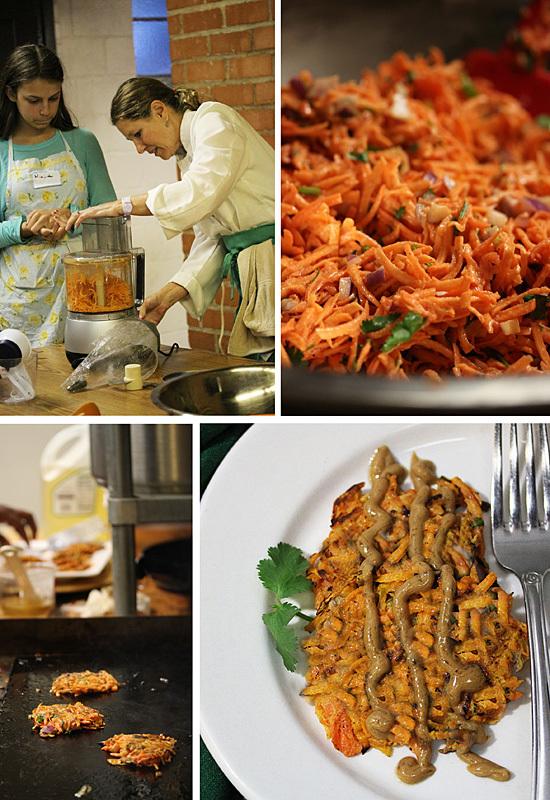 Patricia demonstrated how to grate carrots in the food processor for the Yam & Carrot Latkes. These were served with a Thai Peanut Sauce that was so complementary to the flavors of the yams and carrots. 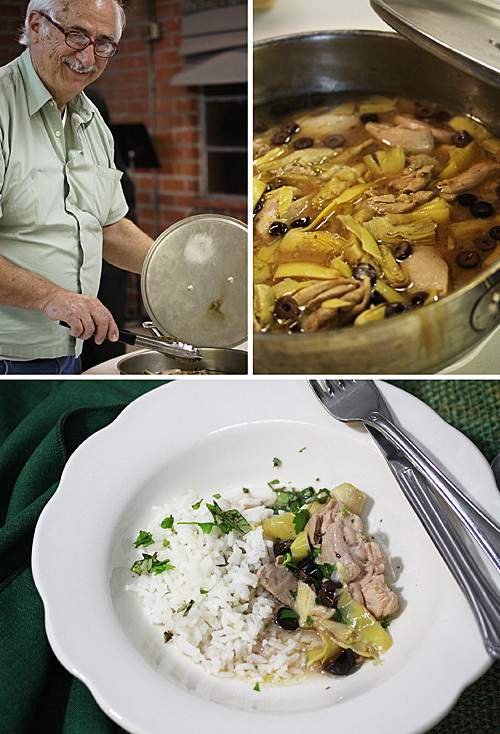 The Tuscan Chicken with Artichokes and Olives was served over rice and also had a wonderful sauce with garlic, lemon juice, white wine, brine from the olive jar, with added kalamata olives and chopped Italian parsley. The student chef was very proud of his creation. 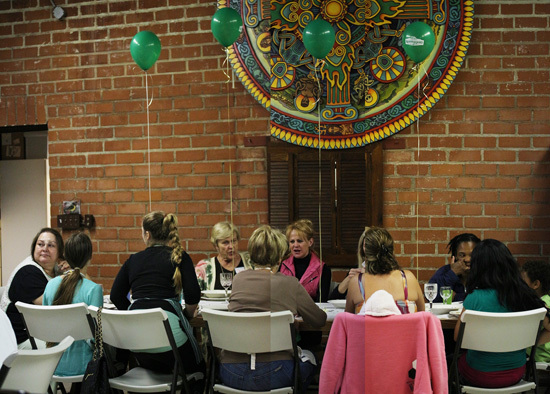 After everyone had served themselves from the buffet, the communal dining table was ready with St. Patty’s Day decorations. 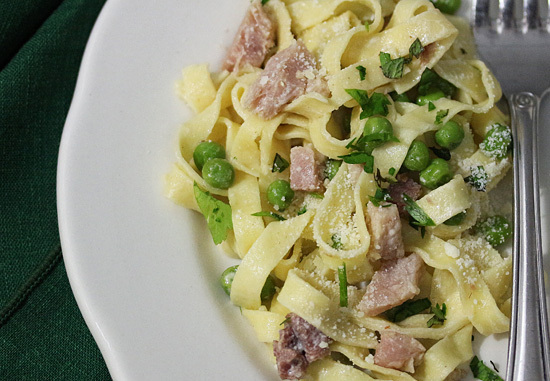 The dish in the bottom photo is Straw and Hay Pasta, with fettuccine, ham, peas and parmesan with a white wine and cream sauce. And of course we finished with the Bailey’s Irish Cream Trifle. Patricia and Fresh Food in a Flash have two cooking classes coming up. Indian Street Food on Thursday, April 11 and Southwestern Fiesta, Wednesday, May 8. You can find more information on her website about time and place. Thank you, Patricia, for inviting me to your class, feeding me delicious food and letting me photograph every minute. I was in heaven. Inspired by St. Paddy’s Day, this recipe is fun, super easy and delicious. Who doesn’t love a little bailey’s? 1. Whip the cream and fold in 2 tablespoons Bailey’s. When ready to assemble, place whipped cream into a piping bag with a wide tip. 2. Prep chocolate shavings by using wide holes of a box grater. Place chocolate bar into microwave for 10 seconds at a time. Test it on box grater to see if it is soft enough to make the shavings. Microwave for additional time until chocolate is pliable, being careful not to melt it. 3. Cut slices of cake into ½ inch squares. Clean and slice all but 4 strawberries. 4. Set four glasses on table. Start with chocolate shavings on bottom, then 1/3 of cake squares, then pour on enough Bailey’s to wet cake. Add strawberry slices. Pipe in whipped cream. Add more chocolate and repeat process one or two more times ending with whipped cream. Garnish with more chocolate shavings and a strawberry cut through the middle at an angle to slide onto glass rim. I’d never think to put Bailey’s with strawberries… how cool! 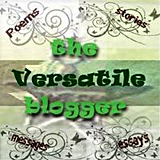 Lynne – Thanks for coming to class and blogging about your experience. 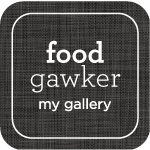 Your photos of the food are so amazing. You made everything jump off the page. You’ve taught me so much and I thank you for that. Looking forward to more cooking adventures with you.